Hola!! Welcome back to reality! I hope y'all had a good weekend! Mine was filled with a trip to Dallas, a bit of horseback riding, and some shopping! I finally got to ride one of our colts that has been at the trainer for a couple of months. It's so crazy to be able to ride a horse you've seen grow up from a little baby! His first show is in a couple of weeks. Cannot wait to see how he does! That skirt is so cute! I am deathly afraid of horses. The last horseback ride I ever took was when I was in CO on a 'trail' (a mountain, really). I had a panic attack and almost jumped off and ran back. 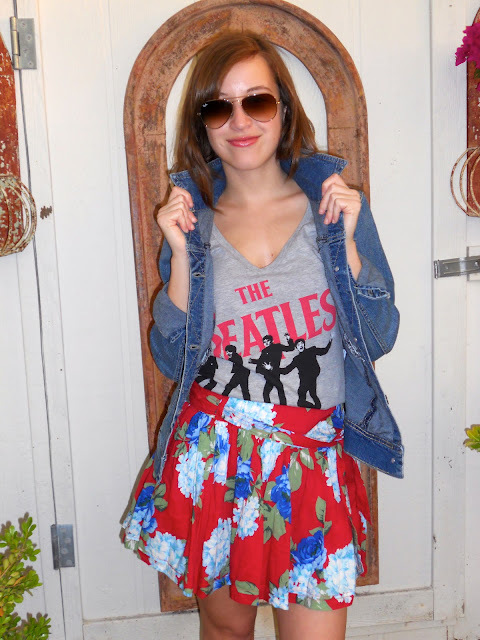 I love how you paired the floral skirt with the band tee, so cute! The sunset in your picture makes a beautiful backdrop. I like how you've out this adorable look together, its cute and flirty, the skirt is great! Cuuuute skirt! Love how your paired it with the Beatles tee. Love the colors in the field pictures. Happy Monday! Great outfit, and such pretty pictures!! Sounds like an awesome weekend! Awesome outfit! I love the bright print on that skirt! The print on your skirt is so cute! I love how you paired everything together! Sounds like a wonderful weekend, hope you get some great stuff, we also have horses, love them seeing right from my window so your gorgoeus photos are so simmilar to our home town, love the colours and you look lovely, as always dear, keep up. I love your Beatles shirt! Especially with the floral skirt. So cute. Thank you for your comment!! Your style is amazing!! I love your skirt, it's so beautiful! Sounds like you had a fun weekend! The skirt is really pretty! :) Your look is so perfect for summer! What a lovely skirt! Very pretty! I've been looking for a denim jacket like that for awhile! Love the outfit. Such a pretty skirt. I love this outfit. Just wanted to tell you that I am having a giveaway on my blog. When you have time, please check it out. Thanks! You look great, love your t shirt! Great pics dear! The light is perfect!! I'm in love with your cokbo! What a cool blog! Absolutely amazing layout! I looove it! Love your shirt! I think you have a super cool look! What a fun outfit! Here comes the summer indeed! Wow the first image is stunning! Such a perfect background and your outfit is beautiful! Couldn't make a much better combo than the print skirt, graphic tee, and denim. So great! Love this look!! The skirt is beautiful! i love this great style! 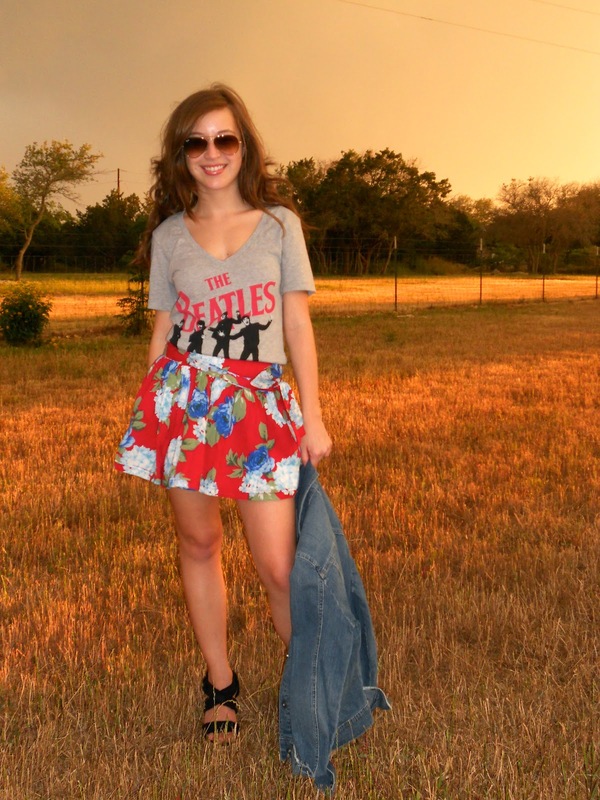 Your floral skirt is just lovely, and I love that you paired it with a band t-shirt; such a great combination! Lovely photos, and I'm super digging the Beatles t-shirt. Whoa super pretty photos! Love the shots in the field! Love the skirt - and that sunset is pretty amazing too! Beautiful look! Love the background! It's so picturesque.The combo of the denim shirt and floral skirt is amazing, super cool! That skirt is awesome - love the rocker styling... looking gorgeous! Thank you so much for your comment on my blog, would u like to follow each other? the background of those last photos is gorgeous! it almost doesnt look real! How did I miss this post? I LOVE the shirt and perfect skirt! Great pictures!! I love this outfit, such perfect prints mixing!!! so cute. the lighting in the field photos is amazing! I want a jean jacket! So cute! I love the funky feel of this outfit. Love this unexpected combo. Your style always inspires me! Loving this! I had seen a few Beatles shirts at Target recently and wanted to pick one up. Now I think I have to! And I love how you paired it with a skirt! 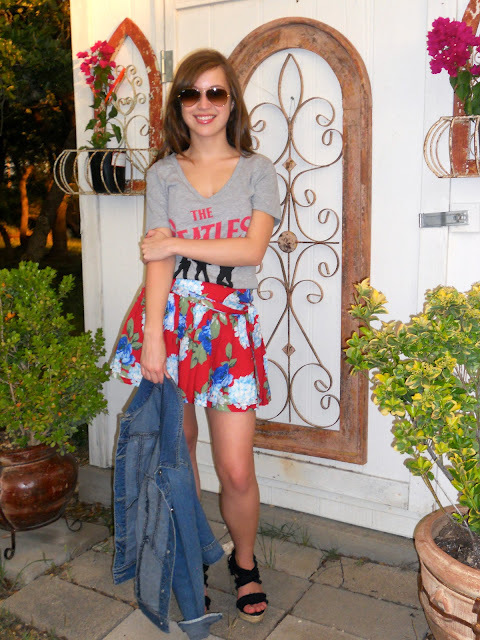 Cute skirt and I love the Beatles tee. great outfit! love the pattern of the skirt and how you paired it w/ a graphic tee! I love how you paired e shirt and skirt and added the jacket to it. Looks great!